It's been a problem that creators who've worked on Superman projects have been dealing with for decades: How do you make the near-omnipotent Man of Steel feel more relatable? Ironically, the newest solution comes from giving Kal-El yet another superpower. Warning: Spoilers and images for today's Superman #38 follow. The latest issue of the ongoing Superman comic is the climax of the "Men of Tomorrow storyline", which had Superman befriending another fantastically powerful sole survivor of a dead planet named Ulysses. When Superman foils a plot to trick millions of Earth's humans into migrating to a new planet that seems like a utopia, he and Ulysses become enemies and brawl it out in a huge fight. As the battle escalates, Ulysses threatens to use his energy-manipulating powers to destroy the Earth. Superman, of course, can't let him do that and fires a blast of heat vision to try and stop him. Then things start to change. Dramatically. The aftermath of the blast leaves both Superman and Ulysses unconscious, with Batman taking Clark to the Batcave to recuperate. 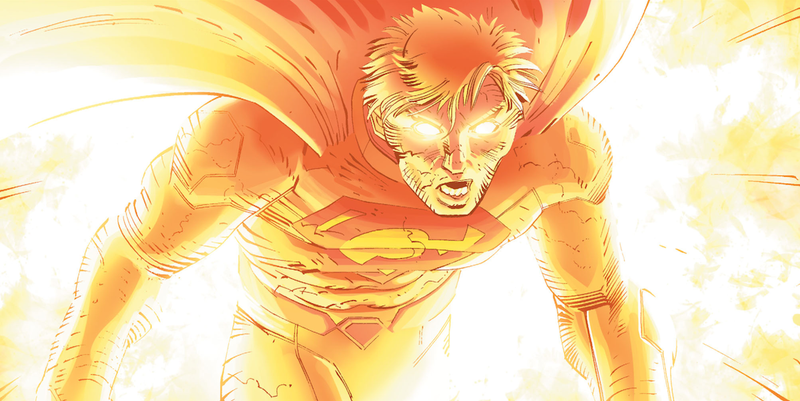 The new power lets Clark expel all the solar energy in his cells in one explosive blast. The super-flare power—which just makes me think of bell-bottom pants—doesn't only make Superman explode like a nuclear bomb. It also makes him temporarily vulnerable. In terms of the character's multimedia continuity, this latest new power is a bit reminiscent of those apocryphal energy blasts used against Kal-El by the Phantom Zone escapees in the Superman II movie. That connection may not be a coincidence since Superman writer Geoff Johns used to work for that film's director Richard Donner, and later co-wrote a Superman story arc with his former boss. So the super-flare might be a nod to Donner. Changes to Superman's power level have happened before, usually with the aim of making the character feel either more accessible or more formidable. He couldn't fly when first introduced and further abilities like x-ray vision and super-breath cropped up as the decades rolled on. The 1950s and 1960s saw the frequent addition of ridiculous new abilities added to make the plots of various stories work. He was famously made invulnerable to Kryptonite in the 1970s, though that didn't last long. When DC rebooted the character in the 1980s, his power levels were no longer such that he could tow entire planets behind him. Superman's pretty much stayed there ever since. Super-strength, super-senses, super-damage-resistant, heat vision and super-speed have been the core parts of his metahuman abilities for a while now. The story possibilities opened up by this change seem to write themselves. If you know who Superman really is, you can force him to use his new power and then try to kill him over the next 24 hours when bullets won't bounce off his skin. The 24-hours-as-a-normal-guy gets around the whole "Man of Steel, Woman of Kleenex" problem, too, if the current Superman/Wonder Woman romance winds up going away. Superman's new power isn't the only change in status quo that happens in this issue, either, but I won't spoil that here. It's already been revealed that Superman gets a new costume in the next issue of his eponymous series as well. As with all tweaks made to characters in a shared fictional universe, these shifts will only become interesting or canonical as other creators twist them into their own interpretations. Will Superman seem more normal as a result? Only time will tell.